Why are T-Lock Shingles No Longer Used? One type of roof design and material no longer found on houses these days are the T-lock shingles. It used to be prevalent among houses when it was in vogue. Nowadays, houses with this type of shingle are rare. T-lock shingles looked like the letter “T” and interlocked with one another on the roof. They were the best in the market when they first came out decades ago. It had the best roofing technology at that time with capacity to resist strong winds. It used to set the standard in roofing and was a popular roofing material from the 1930s to the 1980s. Unfortunately, T-lock shingle had its fair share of serious issues that ultimately led to its demise. No Standard Sizes. 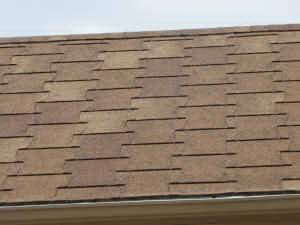 First, there were no standard sizes for the shingle until around the 1980s. The lack of standards presented its own problems. Poor Quality. The early T-lock shingles were heavier and sturdier because of their asphalt content. Later versions of the shingle were thinner, lighter, more brittle and less resistant to high winds. The deterioration in quality was principally due to soaring asphalt prices – manufacturers put more fillers and other materials and less asphalt. New Technology. The arrival and popularity of Architectural shingles further reduced the number of T-lock shingles users to a point that manufacturers found it no longer economically viable to continue producing them. T-lock shingles were, in fact, discontinued by manufacturers based on several issues, including those associated with their weight, or lack of it. Production totally ceased sometime in 2004. Costly Repair. Since replacement T-lock shingles are no longer made, homeowners are forced to spend significantly more money for roof replacement. Roofs that required only minimal patch (and minimal expense) had to be replaced in their entirety for lack of available T-lock shingles. Insurance Problems. Insurance companies are reluctant to accept insurance coverage on houses with T-lock shingles because of their potential exposure to liability since the entire roof must be replaced even if only one T-lock shingle is damaged. Those that agree to cover the house demand, higher premiums and more deductibles. Some insurance underwriters consider houses with T-lock shingles as major insurance hazard. Difficulty in Selling. Because of this insurance issue, sellers are forced to replace the entire roof before they can sell the house, although the T-lock shingles are still in good condition. This type of roof on a house adds complication to real estate transactions.